It is so hot in Spain in the summer that it is almost impossible to eat solid food at lunch time. The best thing to do is to have a refreshing Gaspacho before the siesta, a light tasty cold soup full of vitamins with your daily seven fruits/vegetables in one bowl. Although it does not sound glamorous, you will need to have a piece of stale bread. The bread makes it a soup rather than a vegetable juice. Three inches from a baguette or sourdough bread cut in small chunks to spare the food processor. You add in there four very ripe tasty tomatoes, one red or orange pepper, two cloves garlic, one quarter of a pink or Spanish onion, one quarter of a peeled cucumber, the heart of a celery (the yellow leaves in the centre), four tbsp olive oil, two tbsp wine vinegar, one tbsp balsamic, the juice of half a lemon, two sprigs of parsley, either basil or cilantro. Purée, but not too fine. Dice a little bit of cucumber, green pepper, and add to the puréed soup, sprinkle with parsley. Serve chilled with fresh ground pepper. Depending on the vegetables and your taste, add water if too thick, salt, hot sauce, 1/4 cup white wine, croutons, shreads of Serrano ham (the Spanish prosciutto) or even boiled egg. Today, I added one cup of water and that made enough for four bowls. Pepper: it taste fine to use green pepper, but the color won’t be the same bright red. 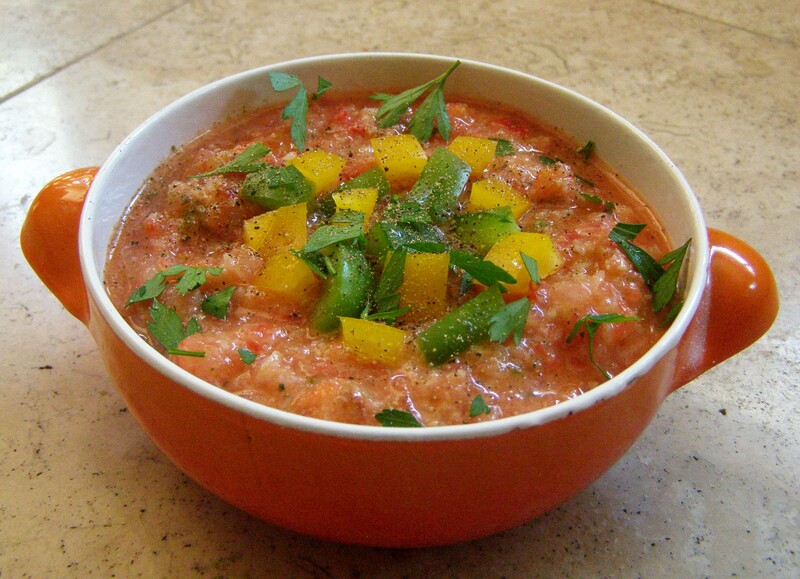 This entry was posted in Soup and tagged cold soup, food, gaspacho, gazpacho, recipe, recipes, ripe tomatoes, soup. Bookmark the permalink. this is an excellent dish. goes very well with some toasted baguette!